Let’s start from the beginning, from Dockerfile. Dockerfile is a plaintext configuration file which is used to build a docker image. I would recommend using centos as a core distributive for the image because InterSystems supports RedHat, and Centos is the most compatible distributive. You can add your name as an author of this file. In the first step, we should install some dependencies, and configure operating systems, as I configured TimeZone here. These dependencies needs for the installation process, and for Caché itself. Let’s define the folder where we will store installation distributive. Let's set up some arguments with default values. These arguments can be changed during the build process. Then we should define some environment variables for silent installation. I decided to set security to the normal level, and I should set some password. You can look at the documentation to find more options. Working directory would be used as a current directory for the next commands. If the directory does not exist, it would be created. You can include license key file if you are not going to publish this image in public repositories. Download manually and place this file near to Dockerfile and use this line. This command will copy and extract distributive to our working directory. Download file directly from the WRC. | tar xvfzC - . In this case, we should pass login password for the WRC. And you can add this lines in this file above. But you should know that in this case, login/password could be extracted from the image. So, it is not the secure way. And the preferable way, publish this file on internal FTP/HTTP server in the company. Once installation is being completed shutdown the instance. But it is not over. We should have some control process In a Docker image and this task could be done by ccontainermain project made by Luca Ravazzolo. So, download it directly from the github repository. Clean up the temporary folder. In case if your docker daemon uses overlay driver for storage, we should add this workaround to prevent starting Cache with error <PROTECT>. You can use this command to check which driver is using docker. Here we say that our image exposes two standard for Caché ports 57772 for web and 1972 for binary connections. And finally we should say how to execute our container. You will see all process of building an image, since downloading source image, to installation Ensemble. docker build --build-arg password=SuperSecretPassword -t ensemble-simple . docker build --build-arg cache=ensemble-2016.2.1.803.1 -t ensemble-simple . Here 57779 and 1979, are the ports which you can use to access to inside our container. This command shows all running containers with some details. You can now open http://localhost:57779/csp/sys/UtilHome.csp. Our new system running and available. UPD: Next part of this article have already available here. It's super satisfying being able to spin up full cache systems with a single command! Have you got any strategies for persistence? Say I log in, add a cache user, edit some globals in USER and then notice Cache 2017.1 is out - how best to upgrade? Stay tuned, I'm going to write next about it. In this article, we did a basic image. Wich will be as a source FROM for next images with some our application. a couple of us on my team have been experimenting with windows containers and i see how easy it is to install cache on linux in a container what about on windows server core container. any ideas on direction with this. Hi, I would not recommend thinking seriously about Caché in windows server core container, I think it is too early, yet. Thank you for the thread! Containers are here to stay, suffice to say that all public and most private cloud providers offers specific services to support just containers. However, we should look at them as a new system. There are many gotchas but also many aspects about them that will help the way we work. -Container layer OS: Running an OS updates on every single triggered build from your CI/CD pipeline might not be the best thing to do if you truly want to know what you have running in production. It's better to ask for the exact OS version you desire in the FROM statement above. In general getting a Docker image "latest" is not such a great idea. -Provenance: we need to make sure we know we are getting the image we think we are getting. Man in the middle attacks do happen. Organisations should make sure they are covered. Please investigate this step and see tools like asking for an image hash image (docker pull debian@sha256:cabcde9b6166fcd287c1336f5....) or even better Docker Notary if your image publisher has signed images. -On Persistence: Obviously your data must be mounted on a volume. One of the nice things about containers is the clear demarcation between code and data. As far as Caché system data is concerned, like the cache.cpf file and %SYS we are working on a solution that will make Caché a 1st class citizen of the container world and it will be very easy to use and upgrades will just work. HTH and thanks again for the thread! This sounds perfect - can you possibly elaborate on details/timeframe? Is there a license model that supports containers and/or microservices ? You have the option to elect license servers for cooperating instances as per documentation. AFAIK, docker encourages to implement microservices. What about classic Cache based app deployment, can docker be useful in this case? By classic I mean the system accessible via several services (ActiveX, TCP sockets, SOAP and REST), multi-tasking, etc with initial 1-2 GB database inside. At the moment I'm to choose a solution to roll up several dozen of rather small systems of such kind. Should I look at docker technology in this very case? I am bound to ver. 2015.1.4. Host OS most likely will be Windows 2008/2012, while I'd prefer to deploy our system on Linux, that's why I am searching a light solution how to virtualize or containerize it. Thank you! Alexey, yes, it is very easy to build a little application just in one container. I don't see any problem, to use any supported technologies as well. Even also possible some load balancing from docker, which also good for microservices. I'm going to show some example with application in the next article soon. Alexey: Docker does not encourage anything aside using its container technology and its EE (Enterprise Edition and cloud to monetise their effort) :-) However, containers in general help and fit very well into a microservices type architecture. Please note how you can create a microservices architecture without containers via VM, jar, war, based solution with a different type of engine. Containers lend themselves to it more naturally. It's worth pointing out that just because people talk about 1 process per container, it does not preclude you from using multiple processes in each container. You could naturally have 3 sockets open, for example, 57772, 1972 and 8384, all serving different purposes + various background processes (think of our WD & GC) and still be within the boundaries of a microservice definition with a clear "bounded context". For more info on microservices you might want to read Martin Fowler microservices article and books like Building Microservices by Sam Newman or Production-Ready Microservices by Susan J. Fowler. Also you should check out Domain Driven Design by Eric Evans where "bounded contexts" and similar concepts like context, distillation and large-scale structures are dealt much more in depth. On the 2GB Database inside the container, I would advise against it. In general one of the advantages of containers is the clear separation of concerns between code and data. Data should reside on a host volume, while you're free to swap containers at will to test & use the new version of your application. This should be an advantage if you use a CI/CD provisioning pipeline for your app. Having said all that, it depends on your specific use case. If I want my developers to all have a std data-set to work against, then I might decide that their container environments do indeed feature a CACHE.DAT. Our Learning Services department has been using containers for two years now, and every course you take on-line runs on Docker containers. As I said, it depends on the use-case. In ref. to your last comment: right now -March2017- I would not use Windows for a container solution. Although Microsoft has been working closely with Docker for over a year, containers are born out of a sandboxing effect just above the Linux kernel (see Kernel namespace and cgroup). - I completely agree that "data should reside on a host volume..." with only one remark: most likely that all this stuff will be maintained at the client's site by not very well skilled IT personal. It seems that in case of Doker/host volume/etc its configuring will be more complex than rolling up Cache for Windows installation with all possible settings prepared by %Installer based class. It sounds like -as you say, having to deploy on-site -if I understand correctly, might not be the best use case. If they use virtualization wouldn't be easier for you guys to deploy a VM that you prepare at your site and just mount the FS/DB they have? That way you'd still have the privilege to run and have guarantees on your build process vs having to do it all on-site. It was clear that we can use VMs from the very beginning of the project, and maybe we'll take this approach at last. I've just looked at the Docker's side willing to search more light/reliable alternative. What should I do if I want to use "prepared" docker image? Stay tuned, I'm going to show how to do it the next part. Continuation of this article already available. 2018/02/14 08:02:24 You might want to start the container with the flag -cstart=false to fix it. 2018/02/14 08:02:24 Error: Caché was not brought up successfully. This error will happen on Windows and macOS, due to docker uses overlay driver there, which is not supported. You should configure Docker daemon to use aufs as storage driver instead. 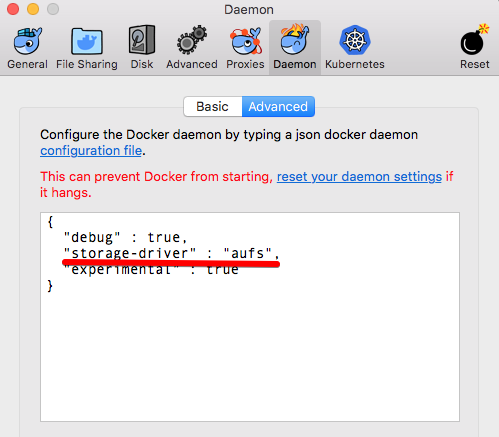 This screenshot from macOS, on Windows a bit different, but anyway, you should choose Daemon, and switch to advanced mode, where you can use daemon settings in JSON format, just add "storage-driver": "aufs", and Apply this changes. It will apply and restart daemon. After that it should work. Step 9/13 : ADD $ensemble-2016.2.3.903.6-lnxrhx64.tar.gz . looks like you did some changes in your Dockerfile comparing to my example, and you did mistake there. Can you share your Dockerfile, so I could check it? where $cache is variable defined few lines above. And when build will run, it will be replaced with value. But in your case, I see $ensemble, and sure that you don't have such variable, and this follows to the error. This behaviour expected if you use default Docker configuration, look at mention about aufs above in comments. But, you should use docker version 18.06, because in newest version already deleted support for AUFS, and InterSystems does not work on overlay driver wchich is used by default in Docker. which will show all existing containers in any state. the storage driver at the moment is overlay2 , how do I go about changing it to aufs. Ive looked on the internet but it always seems the instructions are going from aufs to something else and not vice versa. if you working on Linux, you can try to use device-mapper as storage-driver, which is also supported by InterSystems. At Ionate, we run plenty of enterprise applications and device-mapper works better. Please keep in mind that docker storage default for device mapper is 10GB. @Dmitry - Do you know how licensing and support from Intersystems works for Cache on Linux. Also, have you seen any performance issues? InterSystems has licenses for Linux various systems, so, they can offer license for it, and they have license type especially for docker version based on ubuntu. I'm don't see any issues in performance, and mostly because I don't have so much big projects, yet, and don't use it in production. Current cases are only CI/CD. Interesting looks like such error expectable for RedHat. But don't have any RedHat subscription, and I managed to build an image with RedHat, but with centos repo. And in my case, it works without any errors. Maybe you can contact me directly and send your image, so I can check on it? and I used the latest version of ccontainermain from releases, maybe with this version will be better for you as well. Thanks for the advice Dmitry, the latest version of ccontainermain sorted the issue, I did need to use the --privileged flag when running it so that mem tuning would work.